Rheumatoid arthritis is an autoimmune disease in which the body's immune system attacks itself. 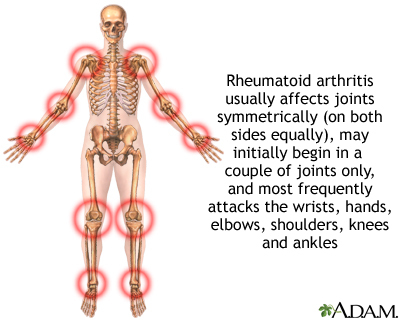 The pattern of joints affected is usually symmetrical, involves the hands and other joints and is worse in the morning. Rheumatoid arthritis is also a systemic disease, involving other body organs, whereas osteoarthritis is limited to the joints. Over time, both forms of arthritis can be crippling. Reviewed By: Gordon A. Starkebaum, MD, ABIM Board Certified in Rheumatology, Seattle, WA. Also reviewed by David Zieve, MD, MHA, Medical Director, Brenda Conaway, Editorial Director, and the A.D.A.M. Editorial team.